Moonz from ADXSoft is a collection of mini-games involving putting objects in orbit, crashing things out of orbit, and defending bunnies from falling debris. What exactly do bunnies have to do with planetary axis? Does it really matter? Moonz opens with chill lounge music and a menu screen. The game offers Quick Play, which allows you to jump into the last mode you played, Play, to start a new game, Resume, Scores, and Tell A Friend, which players can use to spam their friends (though I have yet to find an app worthy of such action). Moonz can be played in one or two player mode. The games are slightly different for both but have the same basic concepts. One player mode offers Time Trial, Sudden Death, Bunny Defender, and Sandbox modes. Time Trial introduces you to the basic concept of the game. After picking a planet and time limit, you must flick objects such as moons, cows, or toilets into orbit. Keep them moving for a short amount of time and you increase their numbers, gaining points. Objects explode when they touch a planet, another object, or leave orbit. Sudden Death is the same as Time Trial, but ends with the first crash. Sandbox is an opportunity to free-play by placing planets and objects in space without time limits or objectives. Bunny Defender, however, deserves its own paragraph. There are these bunnies, which for some reason have disproportionate objects falling on them. These bunnies inexplicably must be saved, so you act as the Hand of God, magically exploding these things before more beloved bunnies are slaughtered. The speed at which objects fall increases steadily until you are just tapping all over the screen frantically trying to save these damn bunnies. Two player mode offers the bunny game with an air hockey-like twist. The screen is split and players launch and volley missiles at each other. There is also a Capture the Flag game, Tag, and Shock and Awe which has you crashing rockets on your opponent’s side. 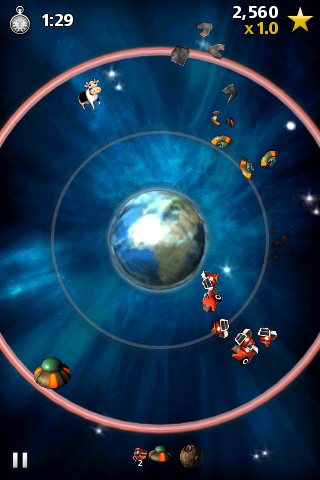 Flicking objects into orbit is the game’s primary control, and the flick sensitivity can be adjusted. The visuals are colorful and the animation has a cartoonish detail making the game playful and casual. Any game where you throw cows in orbit shouldn’t be taken seriously. The soundtrack includes some house music that keeps the game tempo up but doesn’t overwhelm the action. Moonz offers a casual game experience that provides an adequate challenge. If you’d rather shoot monsters with shotguns, you’ll want to find a different game. The variety of modes and two player action keeps the game from being a $1 throw-away app. The Bunny Mode could pass for a cheap but popular app. At $5, players will need to enjoy the concept before throwing down that fin. Otherwise, you may feel like you tossed money into orbit.